Android is currently the most popular mobile OS on the world. And millions of people use Android phone as their primary device. There are a lot of complex tasks being done on Android phone such as taking photos, instant messaging, and recording videos. As we can see, most of them are private staff. When you are selling your phone to someone or simply gifting it to a friend, you will want to protect your personal information and data. No one wants their private information being seen by someone else, even for close friends. That is why it is so important to completely erase Android before handing it down to other people. This tutorial lists all three possible methods to delete data on Android. You can choose the right one according to your own case. Please read them carefully and follow the steps to wipe Android thoroughly. Note: If you are an iPhone users, then this tutorial is the best option to erase all data on iPhone with Safewiper app. It is one of the best programs for iOS users. Each Android device comes with a factory reset option in default. And this method is recommended by a lot of people online because it is the easiest way to wipe an Android phone or tablet. After reset, the device will be back to the state when it was shipped from manufacture. Everything was gone from the visual. Note: the data can be recovered with Android data recovery software and there are a few ones that are quite good at it. I tested 4 programs and 3 of them were able to retrieve my private data from an factory reset Galaxy S5. So if you cared about your privacy, then method 3 is the most secure way to permanently erase Android. Below is a screenshot of data being recovered after reset. You are doing the factory reset because you wish to remove all the data from the phone and not being seen by someone else. 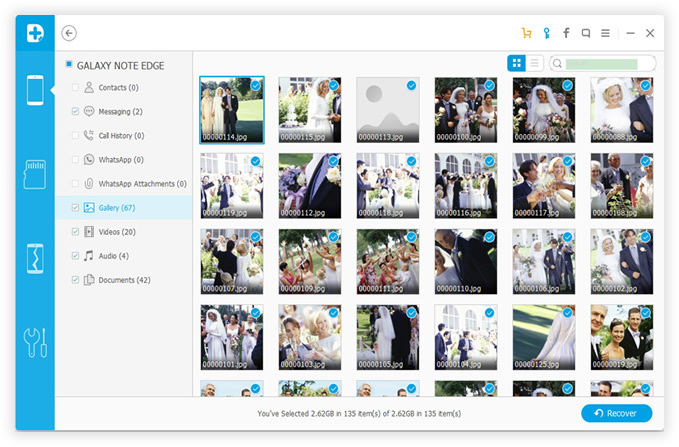 They are still important for you such as contact lists, photos or recorded videos. So it is better to back up your data on the phone for further usage. It would take some time to recover formatted data. 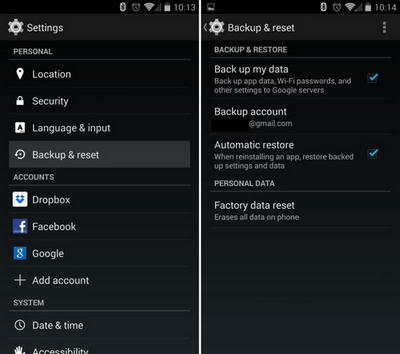 How to back up the data on your Android device: Go to the Settings app on the device and select 'Backup & reset'. Select the 'Back up my data' box. You will be able to back up all your data over the Internet. However, before you start the process, make sure you have chosen the right 'Backup account'. Your backup account is your Google ID where everything will be saved for later restore. Tip: If you found out this is annoying, then you can directly transfer all kinds of data from old Android to new Android within 3 clicks. Alright! So, now all your data has been backed up. You are all set to wipe up your phone and restore it to the factory settings. This process is rather easy. 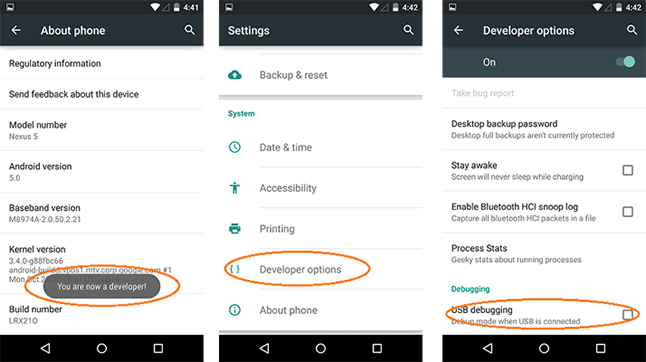 Here are the steps: Launch the Settings option on your Android device. Select 'Backup & reset'. Choose 'Factory data reset'. Confirm your action. That would be it! Everything will be removed from the internal storage of the phone. 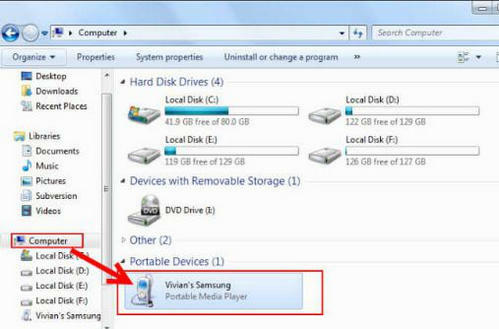 Remember that this method does not remove the data from your external microSD card. This is basically formatting the external storage on your phone. However, remember that this method can only erase the data on your SD card. If you need to wipe up the internal storage as well, you will need to use Method 1. You will need a computer or laptop and a USB wire to use this method. How to format Android SD card: Connect your device to the computer using the USB wire. Wait a little while to allow the computer to detect the device. Go to the Computer folder (in older versions of Windows this folder is known as My Computer). Your device will appear in the 'Portable Devices' section; double click on the device icon to open it. You will now see the External Storage and Internal Storage. Right click the SD card External Storage and choose 'Format'. Choose the format type and then confirm your action. This will remove everything from your external microSD card. The two methods outlined above erase everything from your Android device. However, even if you have encrypted and erased the data, it can still be recovered by an expert. Also, simple formatting, as outlined in Method 2, is even much easier to recover. This means that your data is not safe even if it has been erased. So, what are your options? Thankfully, there is Android Data Eraser program that uses the most advanced algorithms to make your data completely unrecoverable. No matter what kind of the files you had on your Android device, it will remove it all with military standard. This program does not simply erase the data. It also uses special technology to overwrite the deleted area of the memory with the junk data. This means that if someone tries to recover the data from your Android memory, all they will get is junk. This is why it is best to use Android Data Eraser. Download and install Android Data Eraser. Currently, you can use it freely on Windows PC and Mac computer. Don't forget opening the program once the installation was done. Connect your Android phone or tablet to computer via USB cable and turn on USB debugging on the device. 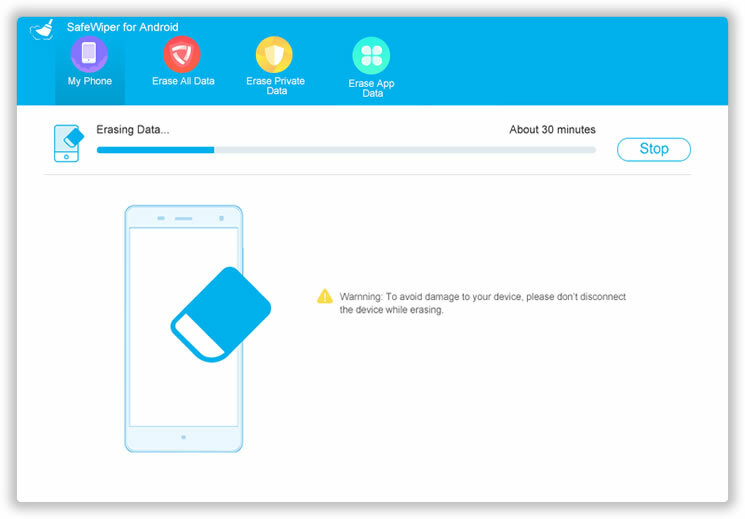 Once the phone was plugged in, Android Data Eraser will detect the phone and list short details about it. Select Erase All Data on the main screen and type delete to confirm the operation. 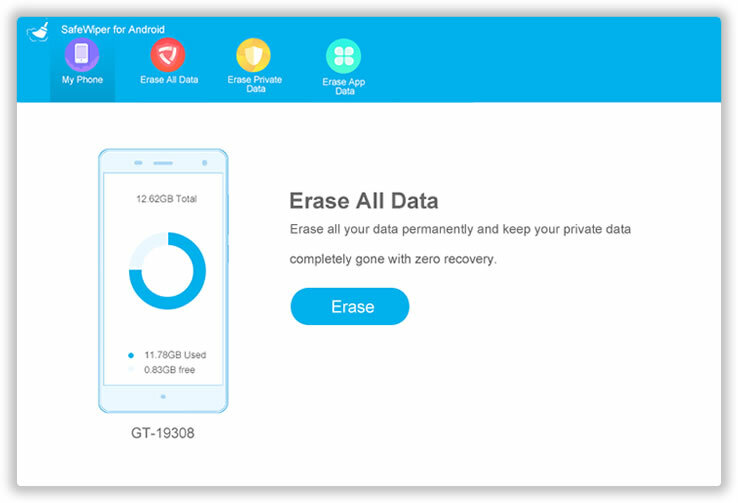 Now, click 'Erase' button to completely delete all data on the phone. Factory reset the phone as described in method 1. After this even FBI agent couldn't pull a single piece of information from the device. 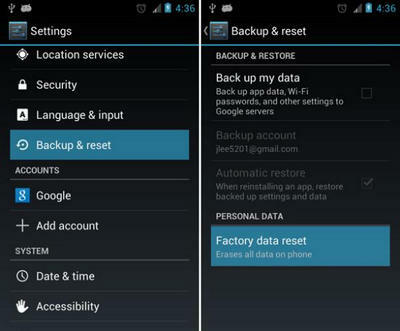 You can factory reset the Android device in order to restore it to the original settings. This will wipe everything from the internal memory. If you need to remove data from SD card, you can format it. However, in both the cases the data is still recoverable. By using Android Data Eraser, you will make your the data completely unrecoverable.